The pacific island nation of Samoa had switched from driving on the right side of the road, as most of Europe and U.S., to the left side of the road, to align itself to Australia, with whom it does most of its business. Now, if you are visiting Samoa, do not plan a celebration or birthday there on December 30, 2011 because that day will simply not exist there. The calendar will jump from December 29, 2011 to December 31, 2011. This nation about halfway between Hawaii and New Zealand with its lush volcanic valleys make it a mostly agricultural nation. It has no military whatsoever! Samoa is just 20 miles away from the International Dateline which was created more than a century ago; and it was decided Samoa would be 11 hours behind Greenwich Mean Time (GMT) and three hours behind Pacific Time in Los Angeles. In those days, Samoa would do most of its business with Americas and would benefit trade and commerce, it being in the time zone close to Americas. Samoa now does most of its business with its neighbors. Now, Sydney, Australia, is 10 hours ahead of GMT which means Samoa has been doing its business with a country that is 21 hours ahead of it. So when it’s Friday morning at a Samoan factory, Australian clients are already relaxing on a Saturday. And when the Aussies go back to work on Monday, the Samoans are still lazing on a Sunday. 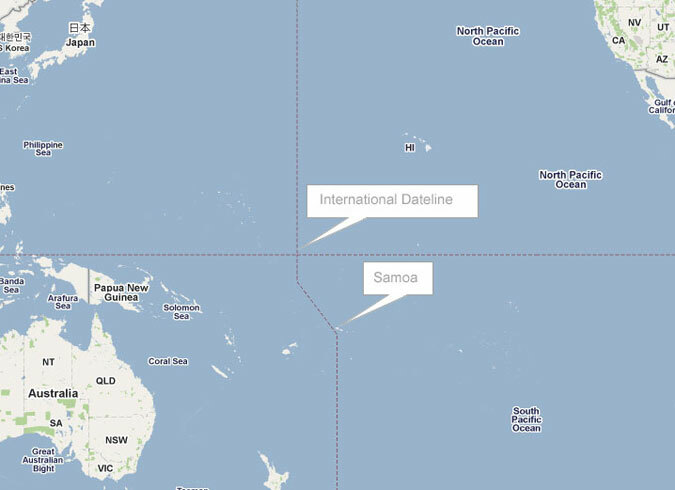 This will change on December 29, 2011 when Samoa will leap forward a day, and it will be just three hours ahead of Sydney.